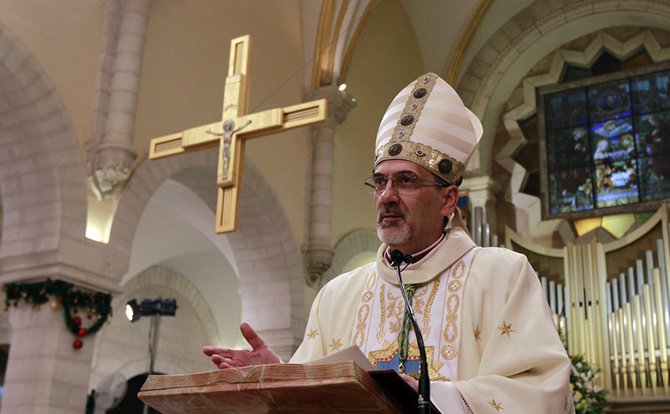 Bishop Pizzaballa: despite the lack of peace and dialogue, stability in the Holy Land must be protected. Some communication channels have prevented the useless escalation in Gaza. Local Christians are active boosting interfaith and social relations. The unity among Churches is “fundamental” to ensure a future in the region. The apostolic administrator of the Latin Patriarchy of Jerusalem bears witness. Jerusalem – New violence in Gaza “would only cause more bloodshed for no good reason”; indeed, nothing has changed “on the ground,” said Mgr Pierbattista Pizzaballa, apostolic administrator of the Latin Patriarchate of Jerusalem. Speaking to AsiaNews, he notes that “everyone has come to this conclusion”. The Holy Land needs stability because “no one has talked about peace talks, negotiations, the search for dialogue for years”. Yet, “there are underground channels of communication” that helped quell the recent violent outburst. On 24 June 2016, the former Custos of the Holy Land was appointed apostolic administrator of the Latin Patriarchate of Jerusalem, whose see was left vacant following the resignation of Patriarch Fouad Twal due to the age limit. The 53-year-old was consecrated bishop on 10 September 2016 in the cathedral of Bergamo (Italy), his diocese of origin. Your Excellency, what atmosphere did you find in Gaza during your recent visit? The Christian community is small, just over 800 people, living in a surreal situation. Gaza’s reality touches everyone: no work, few prospects and being Christian makes everything even more difficult because they are not given jobs. From a social and economic point of view it is a fairly complicated situation. This said, I found them very united. I found an active community; the churchyard is always full of children. They are well organised and from this point of view they can protect and help each other. This point is real and important. What value do their presence and testimony have today in the Strip? As I said, they are 800 against two million people; so, the relationship is already evident in the numbers. Nonetheless, there are three Christian schools, one house for the disabled, twelve very active nuns, and an important Christian (Anglican) hospital. Despite this very small presence, the community is very active and lively. One trait of the Christians of the Holy Land is that they are never idle. They work not only to maintain their presence and their history, but also to boost interfaith and social relations. Exactly! This is the only clear attitude we can have to affirm who we are and to whom we belong. Mgr Pizzaballa, did you expect such a sudden burst of violence? Gaza is always surprising! It is surprising that we should always be surprised, despite everything. The reaction [of the Israeli government] seeking a cease-fire at all costs, which then led to the resignation of the Defence Minister [Avigdor Lieberman], was also a surprise. There is the impression that there are underground channels of communication, even when violence bursts suddenly. This should not come as a surprise. But – and I hope I’m wrong – I can’t exclude this from happening again. Even though this time damages were limited and a way out was sought soon as possible …? I think there is a lot of realism, because a new explosion of violence would not change anything on the ground for both Israel and the Palestinians. It will only bring more hatred and complicate things even more. From a military and political point of view nothing would change. It would only cause more bloodshed for no good reason. I think everyone has come to this conclusion because this is certainly not Gaza’s first crisis. It is clear that another solution must be found. Now only journalists and opinion writers talk about peace. We say we need stability, change the pace, but sadly no one has talked about peace talks, negotiations, the search for dialogue for years. The problem is that no one is talking. On the one hand, the Israeli-Palestinian question is no longer addressed; on the other hand, the two parties in question are no longer talking. The fundamental point is all there. Is the role of Christians as a bridge still valid and plausible? First of all, we must clarify that this is not the time of great gestures, of great initiatives that can change the course of history in the Middle East. It’s time to work on the ground in small areas: school, hospitals, inter-family relationships. This is where we can express ourselves and make a positive contribution to social life. At this moment, there is nothing else. How can we back this mission? First of all, with prayer. And then with pilgrimages, which are important because they bring first of all job opportunities. [Work] is a great necessity in the Holy Land. And then talk about this reality, let others know more about it. Yes, there are so many [tourists] and there are almost no more places to host them. The upcoming Christmas holidays are a good opportunity to undertake this experience. Your Excellency, what issues will the Church in the Holy Land bring to the next meeting of the Eastern Patriarchs, in Baghdad, later this month? As the Latin patriarchate we will bring our reality, talk about our problems and listen to others. This is an opportunity to share and look at common problems, as well as possible initiatives to be taken. Greater unity among Churches is fundamental and this can be seen across the Middle East, from Iraq and Syria to Jordan and the Holy Land. Of course, with different circumstances, but relations have improved a lot.